In Sydney, it’s quite often the case that serving great food just isn’t enough to guarantee a restaurant’s success. If you don’t already command a strong name for yourself, then it’s time to take some risks. How about a restaurant that does away with red meat entirely, focusing purely on catches from the sea? That’s Saint Peter’s game. You could easily walk right past it without knowing! 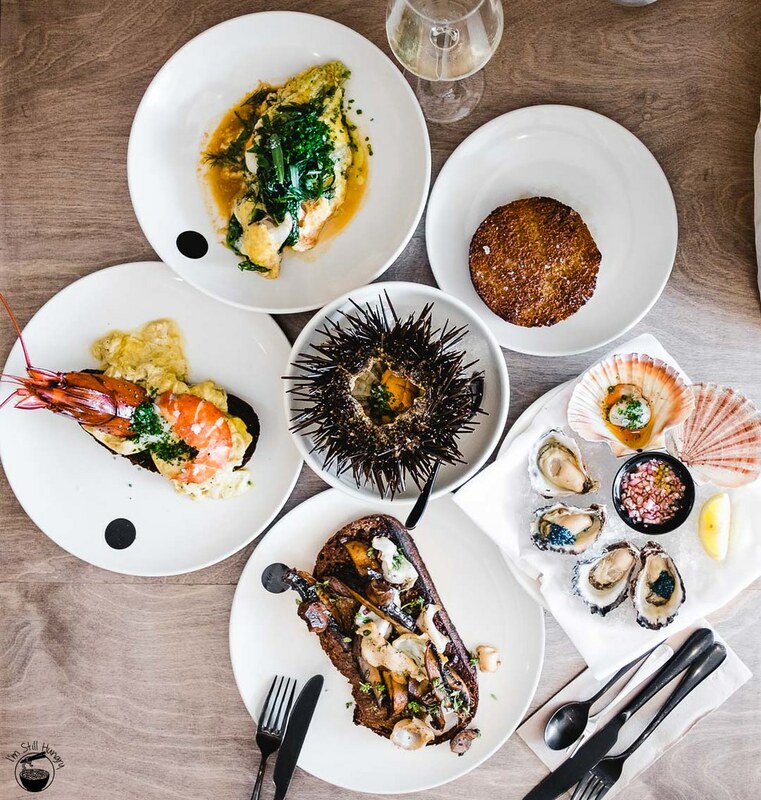 In a nation of red meat eaters, you’d think Josh & Julie Niland would be playing with fire in choosing to open up seafood-only Saint Peter. But they’re probably more skilled with fire than you are. 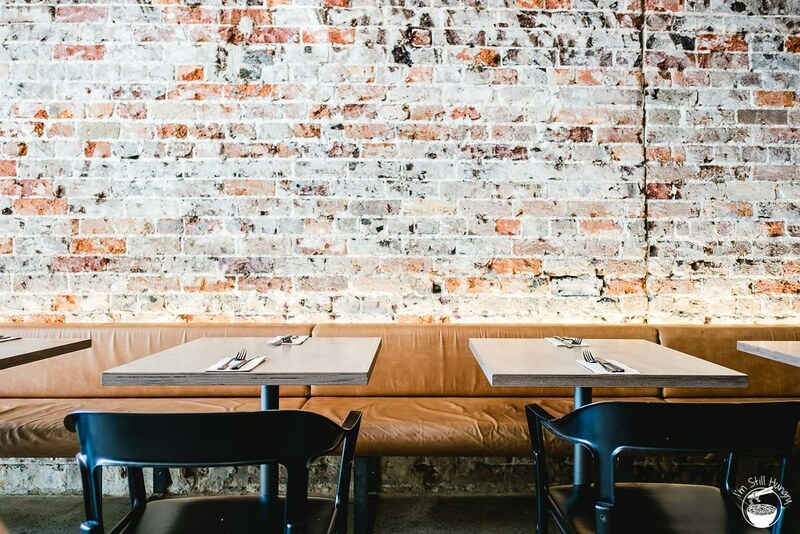 The dedication to their craft is obvious – putting aside the fact that Saint Peter is betting on a seafood-only gamble, most restaurants don’t feature a cool room dedicated to ageing entire fish for intensity and flavour. The space itself is quite small, seating an odd 30 or so. Naked brick makes a return, a somewhat spartan look that, with my odd train of thought, makes a decent backdrop for taking photos. 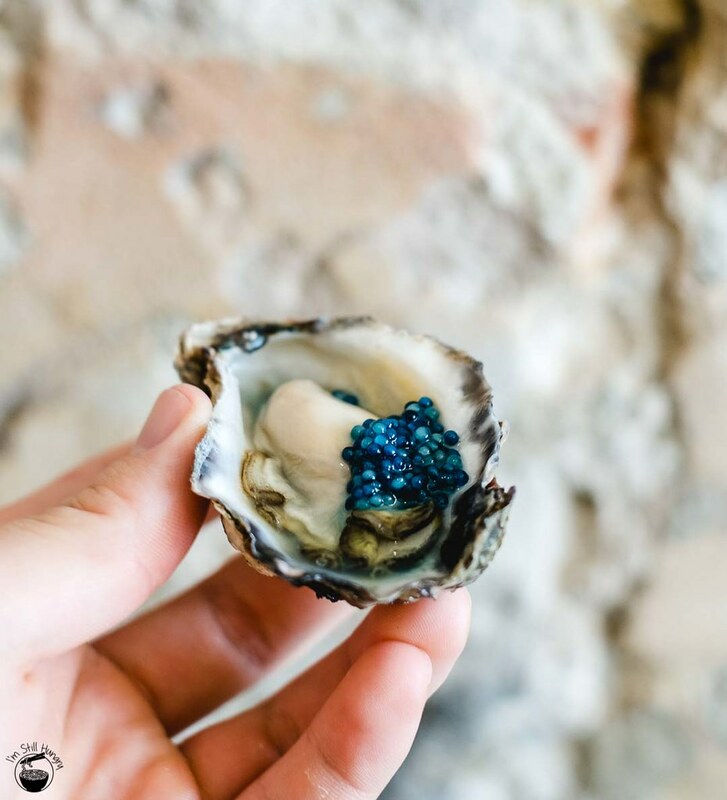 The space was previously operated by a sushi train – clearly, I’m not the only one who’s curious to see how this rather drastic evolution of seafood-focussed businesses in the same space would fare. 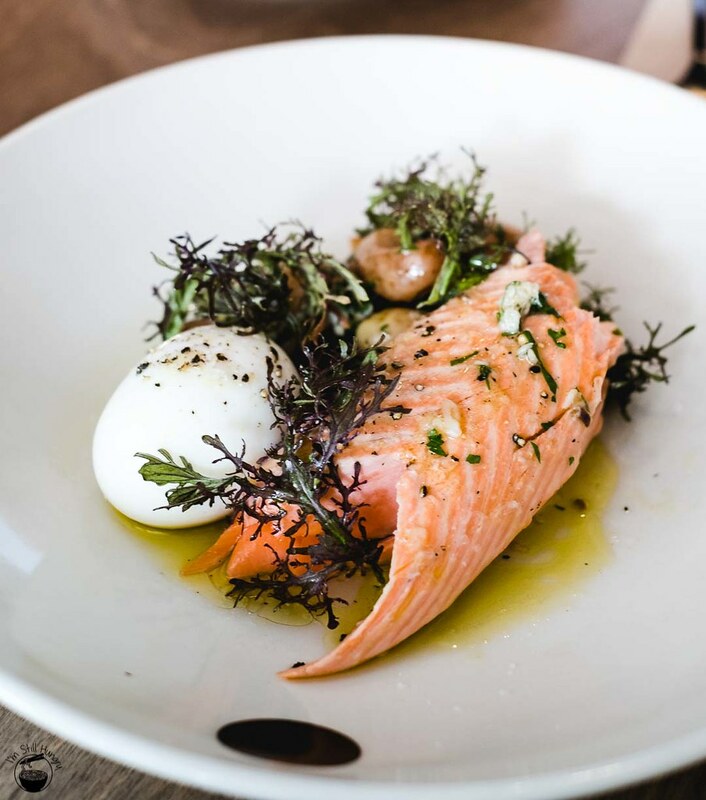 Saint Peter runs a brunch menu on Fridays and weekends, with dinner all nights bar Monday/Tuesday. 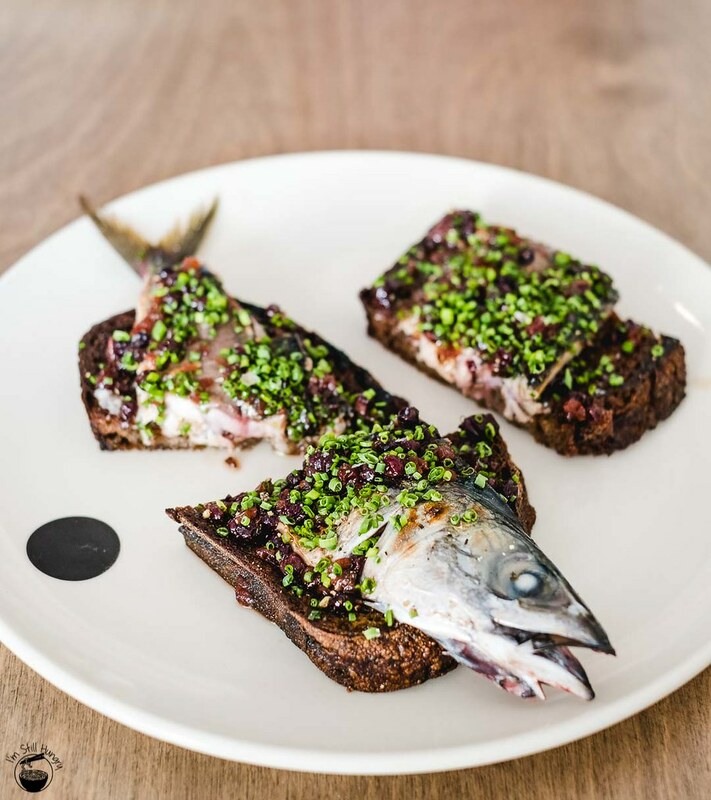 While you won’t find your usual mortgage-busting avo on toast on the menu, you will get an excellent toast from Berkelo Bakery – just with all sorts of critters and swimmers from the sea on top. 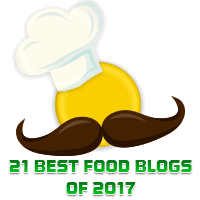 Most menu items lists the location from which the hero ingredient was sourced. Given that the brunch menu alone has 15+ items, you could easily get your Australian Geography marks from a C to an A just from Googling them all. The menu is ever-changing, and that’s not just a set phrase – it is quite likely that what you eat just the next day could be completely different to what I ate today. 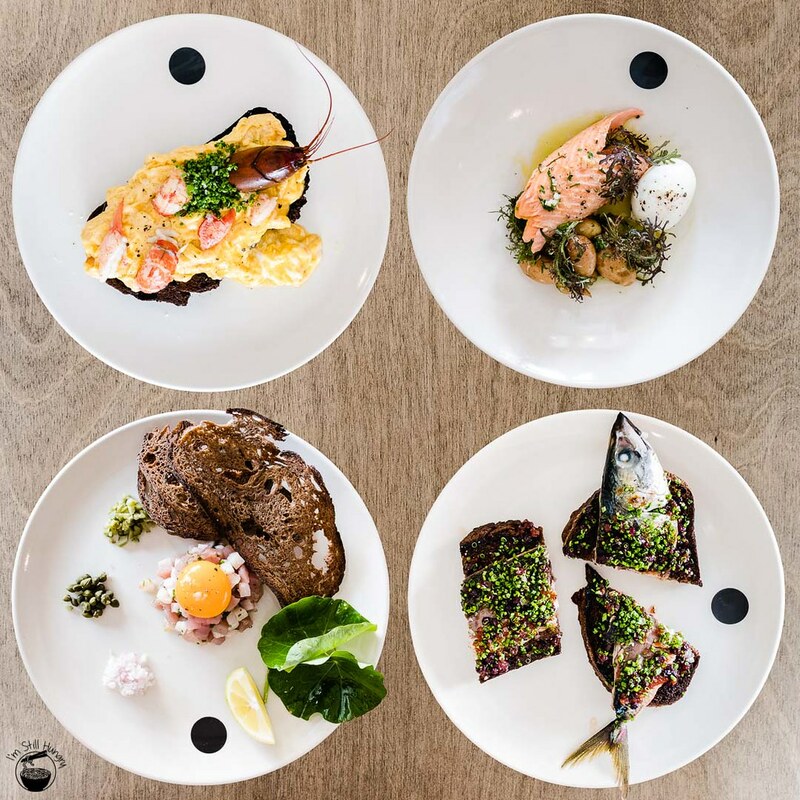 While I sometimes joke about slow service as “what, they have to catch the fish?”, it really is the case at Saint Peter – Niland is only cooking with the best of what he finds, sourcing from all over Australia. 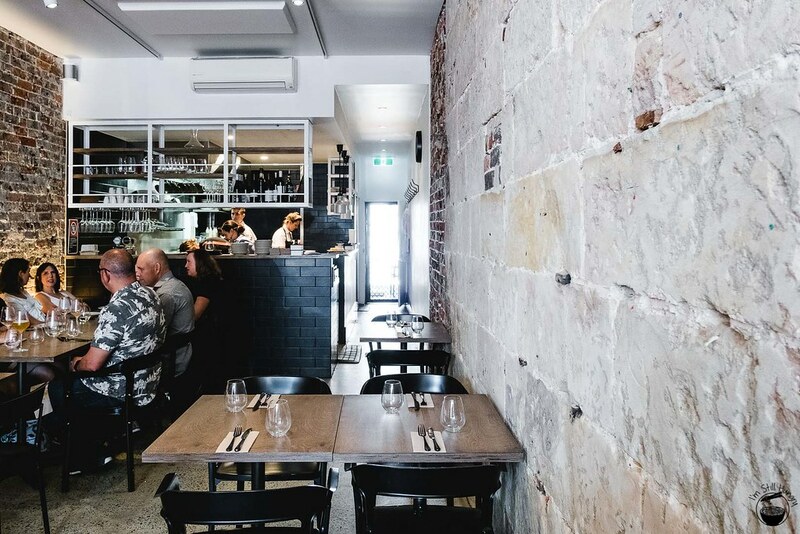 Food is paired with a tight one-pager, all-Australian wine list. 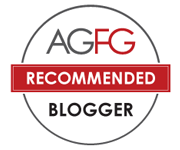 For the record, the CRFT Logview Vineyard Gruner Veltliner, with its high levels of acidity and tartness, made for quite a good pairing with egg and white seafood-based dishes. Furthermore, Saint Peter’s brunch/lunch offerings differ substantively to dinner. I’ve been for brunch twice now, but I’ve yet to sort out a dinner here. Spoiler alert: if the quality of their brunch is a yardstick to predict their dinner offerings, then I need to get here after sundown. But first – onto the brunch spread! What’s cookin, good lookin’? It’s a beautiful spread – and yes, that’s taking into account my unadulterated love of seafood. Wine and oysters, with a bit of cheeky sea urchin on the side all during the AM? I ask you – why not? But first, to assuage those who are still hesitant about chowing down their body weight in seafood for brunch without something “breakfast-y” to start – filter coffee by Artificer ought to get you onto the right track. Artificer is famed for its filter coffee, and in fact Saint Peter doesn’t offer any other option – you’ll have to get your latte elsewhere. That said, a small carafe of milk was provided, for which a small dash was sufficient for me. The taste was surprisingly indistinct, with only slight woody notes being detected. The oysters in the above picture were from Bells Island, while on my second visit they were Tunstead Oysters from Port Macquarie. 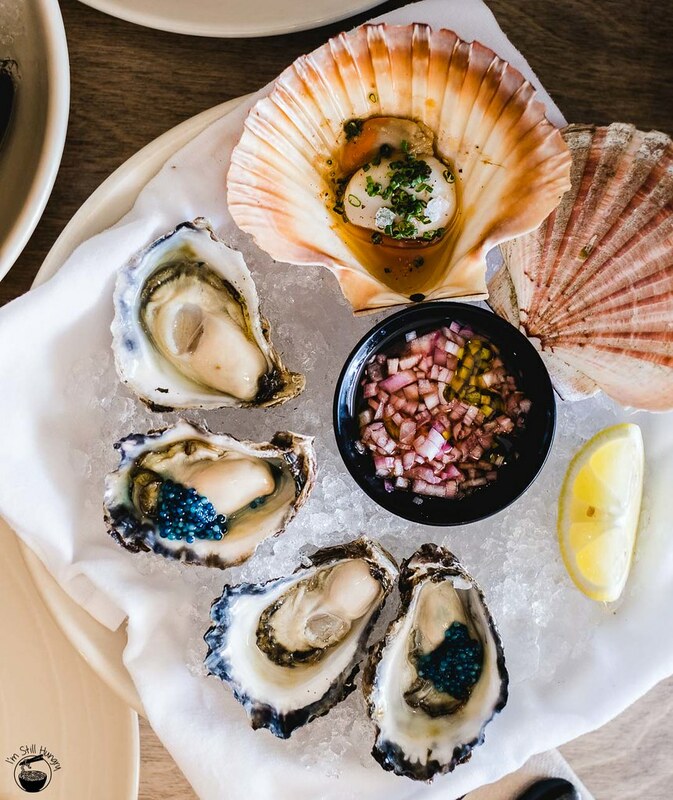 They were more or less the same visually and in taste – sporting a mildly sweet, slightly smoked flavour that could be taken just as well raw or with the tart onion mignonette. No comments on the scallop I’m afraid – it was the one thing I didn’t eat! The scampi caviar added a surprisingly nominal amount of umami that wasn’t anywhere near as concentrated or plentiful as caviar from sturgeon. I wouldn’t say it’s worth an extra $14, however it’s one of those things that you absolutely must try in order to satisfy your curiosity. That’s a small price to pay, right? Look, you already know my relationship with the quintessential marron: “sees marron -> open wallet”. 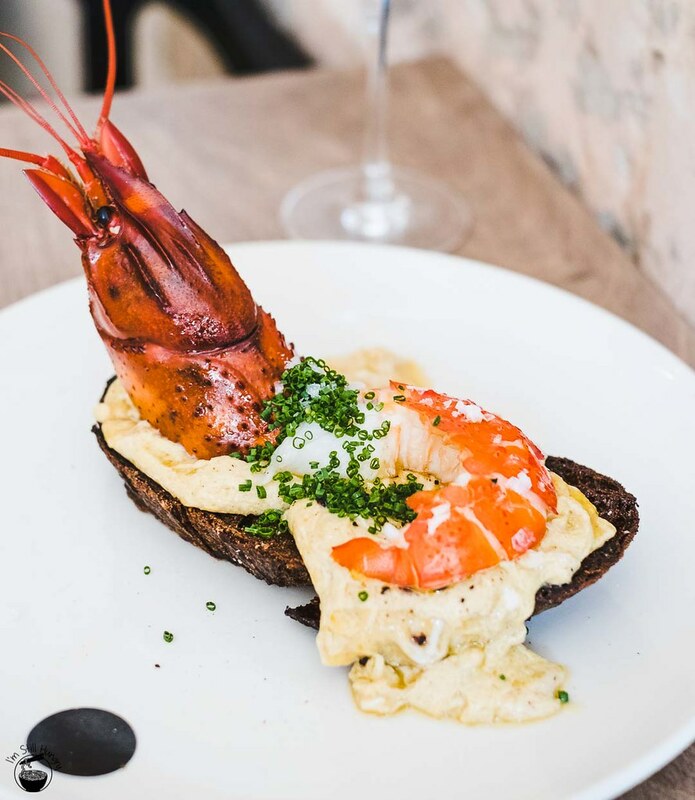 Donnybrook Marron on scrambled eggs was a new way for me to enjoy the venerable crustacean. 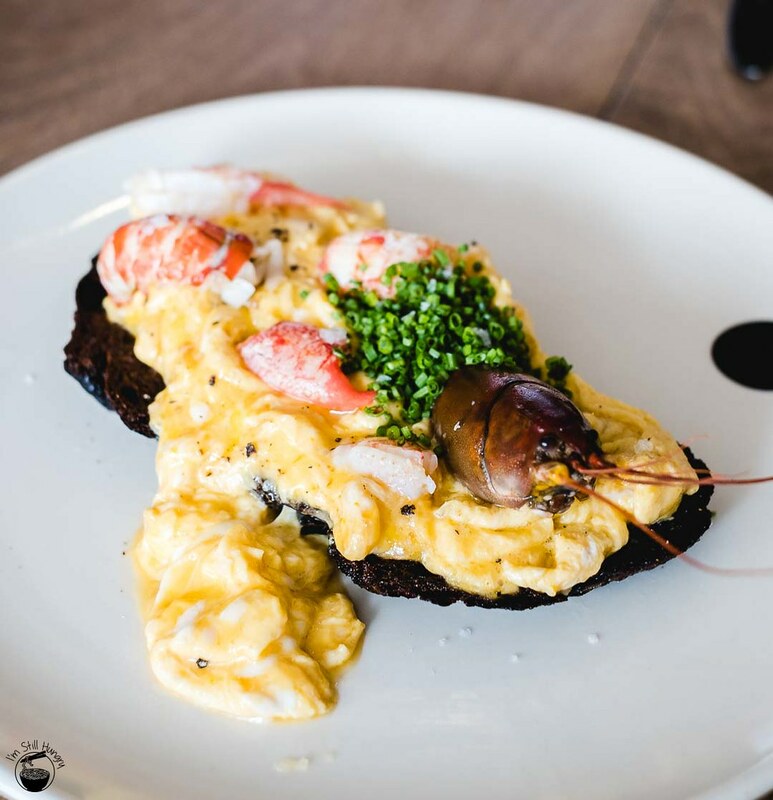 Two things, straight up: Saint Peter uses Berkelo Bakery toast as the base for many of its brunch dishes. It’s ridiculously good, with a boundless level of textural complexity (think crunch of all kinds – from crispy to candied, to hard & crusty) depending on the dish, and full of natural flavour. That’s one. Second: Niland sure knows how to fry up a good batch of scrambled eggs. The basis for several dishes, this gooey mess is pretty much what makes getting up in the morning worthwhile. Now, add perfectly-poached, tender marron to this holy combo, and I believe I’ve made the business case for this dish, no? 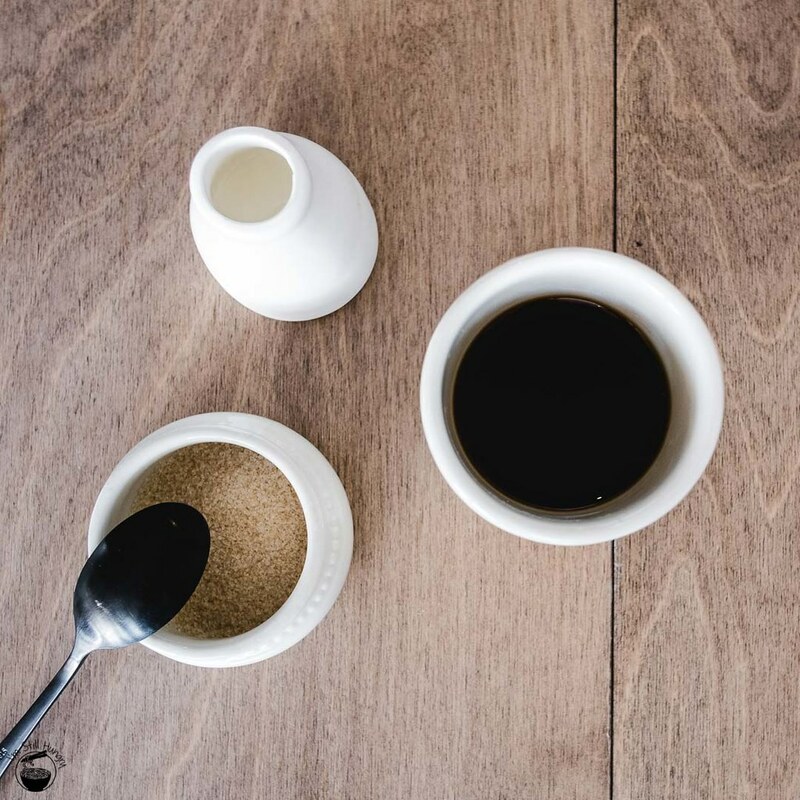 Of course, nothing’s perfect – it would be good if salt and pepper shakers could be provided, as egg seasoning is highly subjective. For me, I would have preferred just a bit more salinity and a generous dose of pepper. Secondly, while the marron was poached to textural perfection, it could have benefitted from flavour boosting in whatever poaching liquid is used. 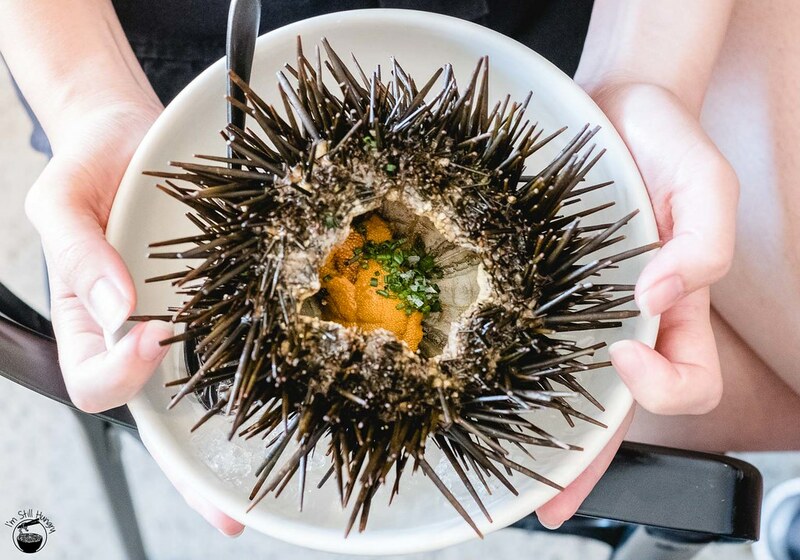 How about Eden sea urchin with a butter crumpet? First up – points for serving the sea urchin within its shell; the presentation was strikingly beautiful. That we were required to serve ourselves, by transferring the urchin to the crumpet (pictured in the first food photo) heightened the level of involvement with the dish. 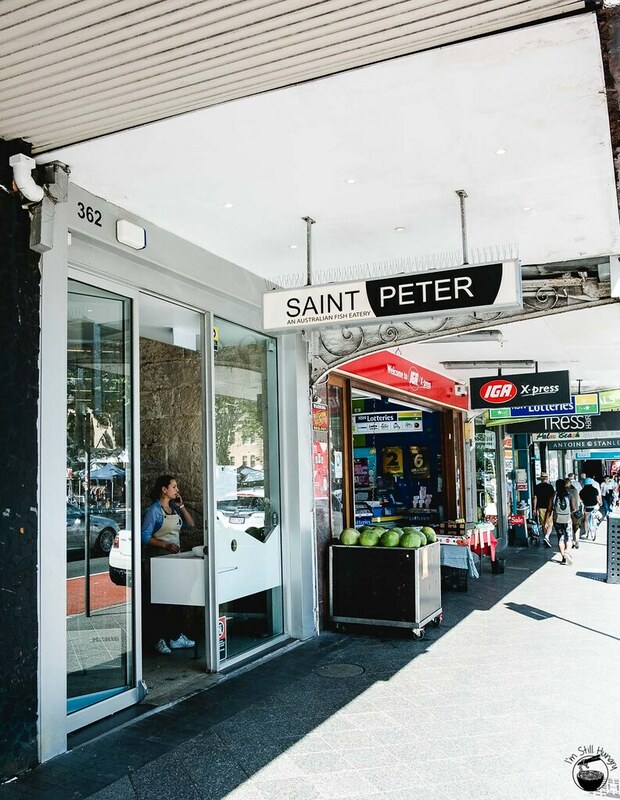 While every Chinese person and their grandma have had abalone (often steamed whole in the shell with heaps of XO sauce which is the “Chinese Special Method”), Saint Peter’s done something completely different. 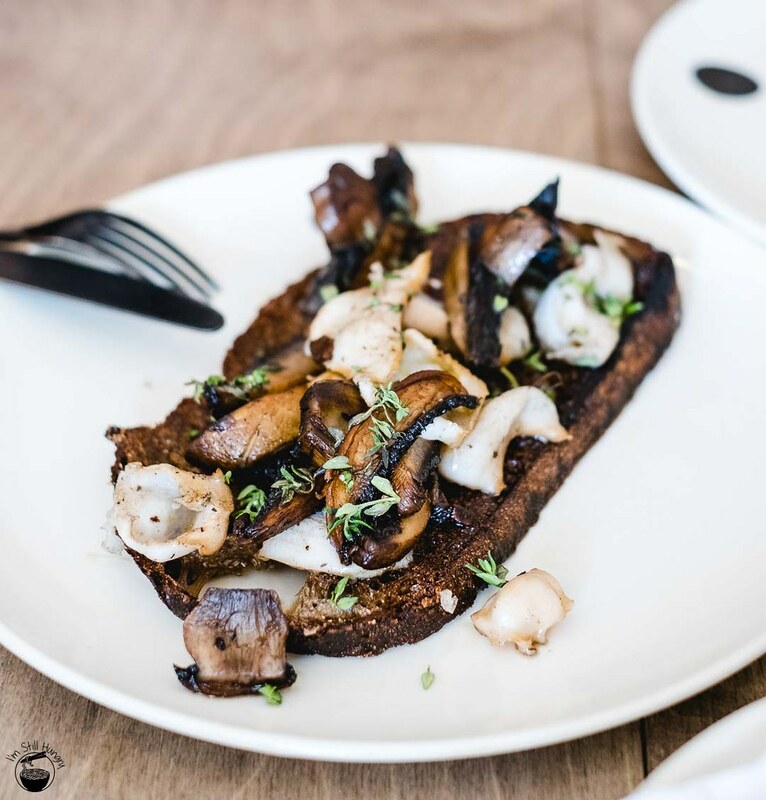 Black lip Abalone is diced up, pan-fried, and served with butter-fried portobello mushrooms on that same great Berkelo toast. Yo damn, this is what a textural dish should be – abalone that isn’t rubbery, mushrooms that are soft and juicy, crunchy malted sourdough and of course, butter, butter everywhere. It certainly isn’t the prettiest looking dish on the menu, but should you judge, you’d be missing out on a black swan of a dish. 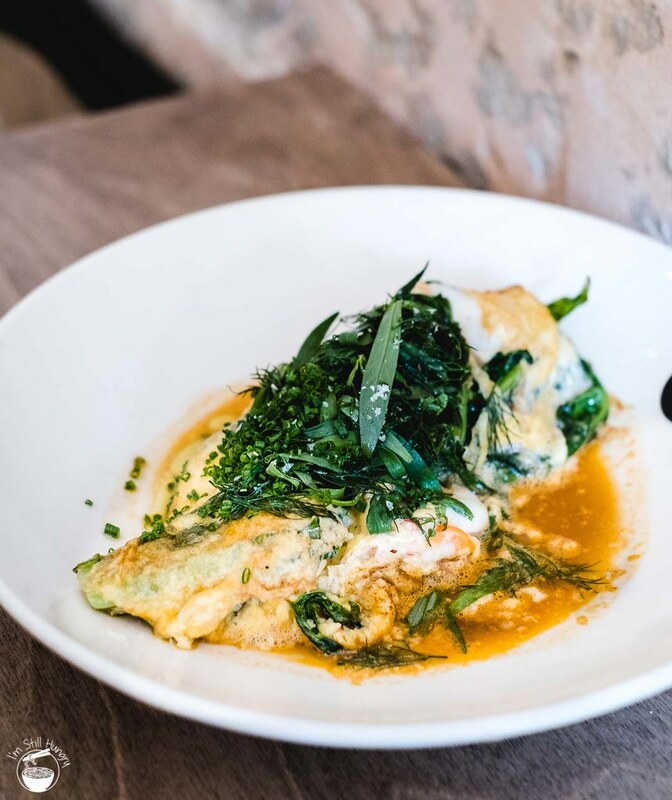 Here cometh eggs once more with a ravishingly tasty-looking Mooloolaba king prawn omelette. On 17 December this happened to be a Queensland king prawn, and yet another time it was Ballina spanner crab omelette. I feel like if you’re a Paddington local, you could visit every weekend in a month and taste four different omelettes. Regardless of which one you get, you can be assured it’ll be good – purely because the three eggs used in the omelette were exceptionally cooked. Seafood omelettes aren’t actually a strange menu item, so feel free to utterly destroy this pile of eggy goodness without reservations. Our elastically chewy king prawns were helped out by the generous puddle of fishy broth, and while I wasn’t a fan of the amount of tarragon on top, they did add a bit of spice to the dish that almost gave it an Indian feel. Omelette fans – this one’s for you. With the first visit having given me a dericious (sic) sample of what Saint Peter’s brunch menu had to offer, a second visit with the parentals was never going to be too far away. As suspected, nearly the entire menu has changed, but that’s okay – I’m shoring up my Australian geography one plate at a time. 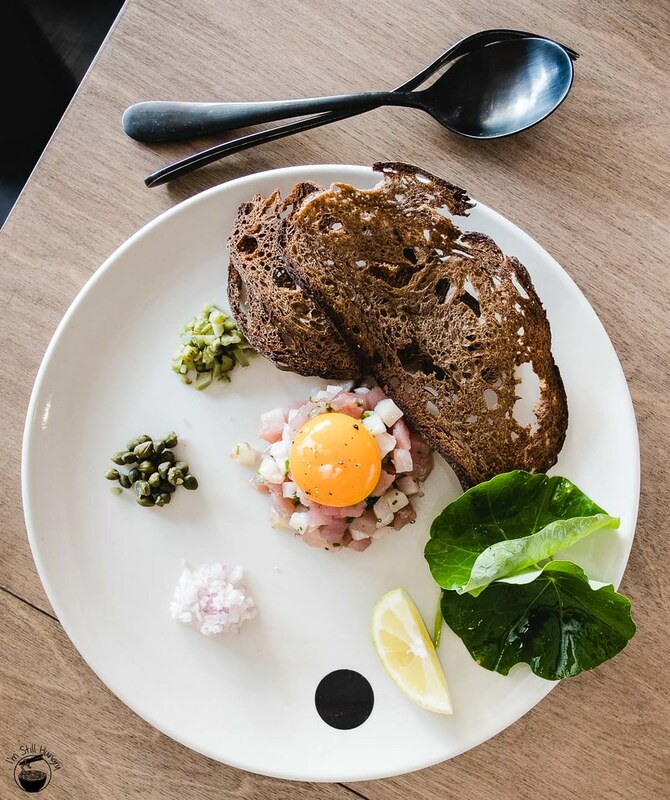 After our artificer brew, the meal started off with a picture-perfect plate of Mooloolaba albacore tuna & broadbill swordfish belly w/capers, onions & chopped pickles. The plate was completed with a breakfast vibe-inducing egg yolk, and some greens in the form of fresh sweet potato leaves. It has egg yolk, that makes it a breakfast dish, right? Swordfish is fairly tough amongst fish in terms of texture. Chunks of the stuff contrasted well with the much softer tuna, and when eaten with the primarily sour & crunchy condiments, made for a light, very zesty and ultimately refreshing “entree” into brunch. The fish were enhanced with gooey egg yolk, that much was for certain, however the overall flavour profile of the dish was perhaps just a tad too light for me. Nevertheless, all components tasted very fresh. Frankly speaking, mackerel is a contentious fish. It’s incredibly pungent, and needs a good dose of flavours from other sources just so its own can be reined in. More often than not, I’m simply not a fan of mackerel, usually preferring almost any other kind of fish. 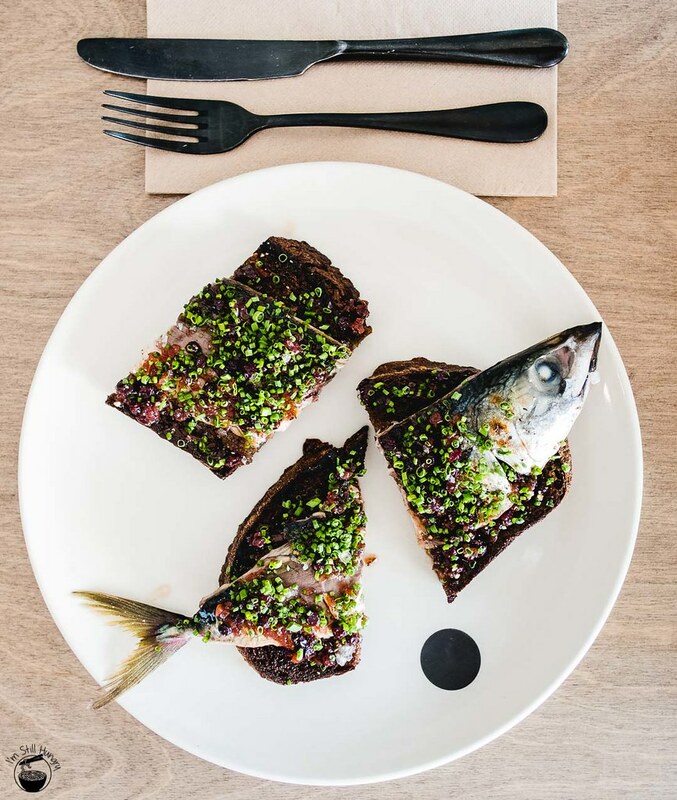 But this time, Saint Peter’s take on Ulladulla blue mackerel and chucking it on toast with a stunning sweet & sour onion, capers & raisin relish has completely redefined what I can expect from this oft-disparaged fish. This is a dish that, similarly to its attention-grabbing presentation, did not hold back on flavour one tidbit. The flavour train, paired with the buttery-soft flesh of the mackerel itself, was impeccable. Even it’s usual pungency was seemingly restrained, as the overall flavour profile was so acute but balanced. I could argue that it’s actually too much for the palate, especially following the dainty fish tartare earlier on. But that would be my only criticism – this is otherwise one of the best dishes I’ve had at Saint Peter; and a brunch favourite. 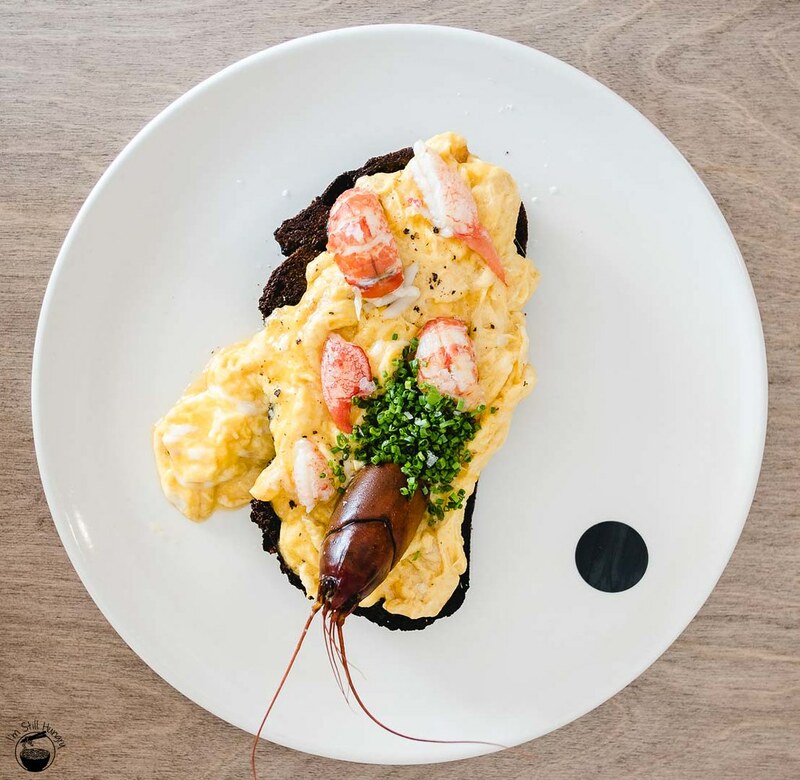 In the three weeks between visits, Saint Peter has swapped out the Donnybrook marron in its scrambled eggs dish and replaced it with its smaller cousin – the common yabby. Yabbies may be smaller in size relative to marron, but there was just as much meat on this egg pillow and for that, I was most grateful. Despite the seafood swap, the dish has remained fully consistent, with the same flavour profile in almost every way. I still want S&P shakers though! 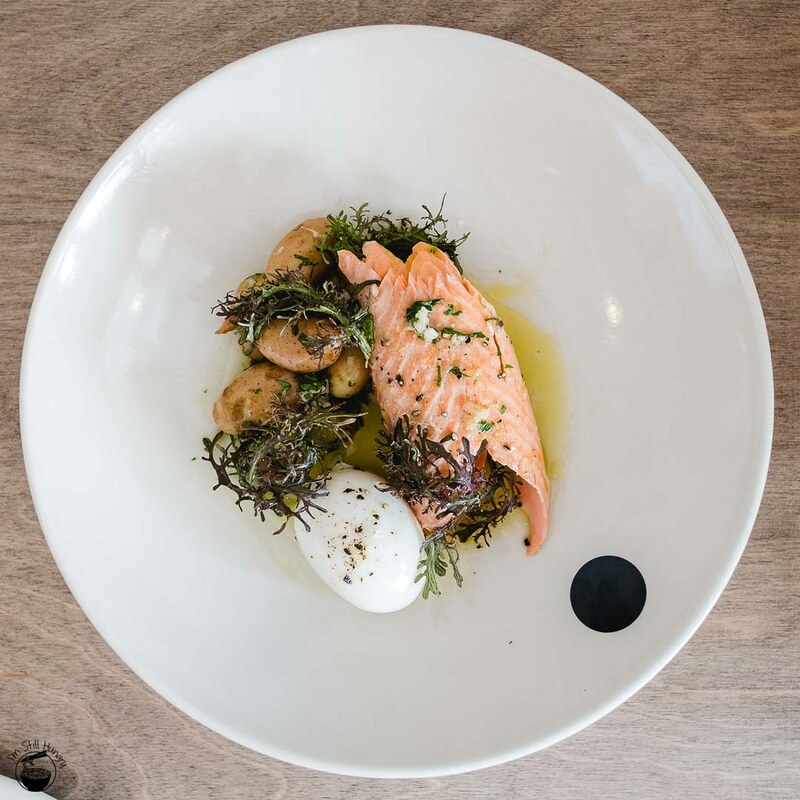 A main-sized serve of salt roast ocean trout completed the brunch, with a generous slab of pink goodness hero-ing the plate, a semi-boiled egg on the side, and plenty of starchy, creamy bite-sized Dutch potatoes rounding it out. The fish was texturally perfect, however suffered from ever so slightly inconsistent flavouring, with some parts tasting saltier than others. There was also more oil than necessary, which made the presentation just a tad sloppy, but there’s no denying that there was a ton of smoky flavour to it – I couldn’t resist using it as a dipping sauce. Definitely the kind of course to do away with any remaining appetite, should you still have any at this point. There are also a series of 2-3 desserts on the brunch menu, ranging from oddities such as cobia fat caramels, or a simple but seemingly devastatingly effective lemon tart. As we didn’t have much of an appetite at this point, I could only gawk at the desserts of other tables. Like much of Saint Peter’s savoury dishes, the ingredients appear few, high quality, and expertly prepared. Yeah okay, you’ll sea me here again. It’s unnecessary to give the accolade of “I’ll be back”, as I already pre-empted myself. There is no doubt the Nilands are working wonders in the kitchen at Saint Peter. Everything is incredibly fresh, but the magic is simplicity – keeping a laser focus on just one thing, and doing it right. 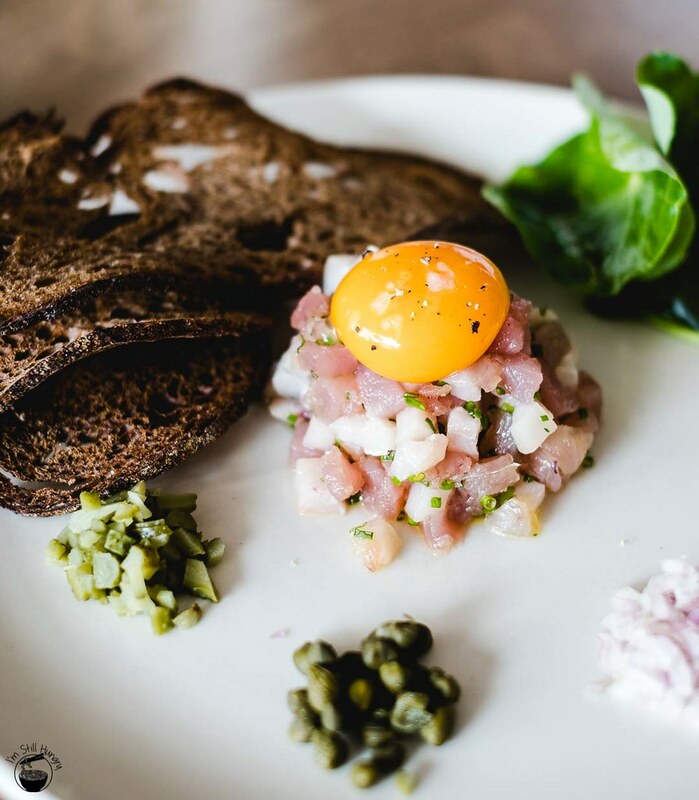 Here’s a restaurant that, unlike the constant unknown that’s associated when fishing, has an almost certain future at carving out a niche for itself in the realm of refined, produce-driven dining. Other seafood restaurants, take note – Saint Peter is calling your name. What are your thoughts on a seafood-only restaurant? Let me know in the comments below!